* (1:27) Dan will be on the Connections radio show on Wednesday, November 8th, from 10:30pm – 11:00pm Eastern time. You can find how to tune-in here. * (4:00) Whatever this con is called, it’s occurring on June 22nd and 23rd, 2018. If the Wing Night funds, that will be on June 21st. * (12:03) Admission to the convention is free. Whether it happens or not is purely up to the Kickstarter, which we hope you’ll back! * (18:21) Taking Bob’s place. * (21:26) The con’s location. 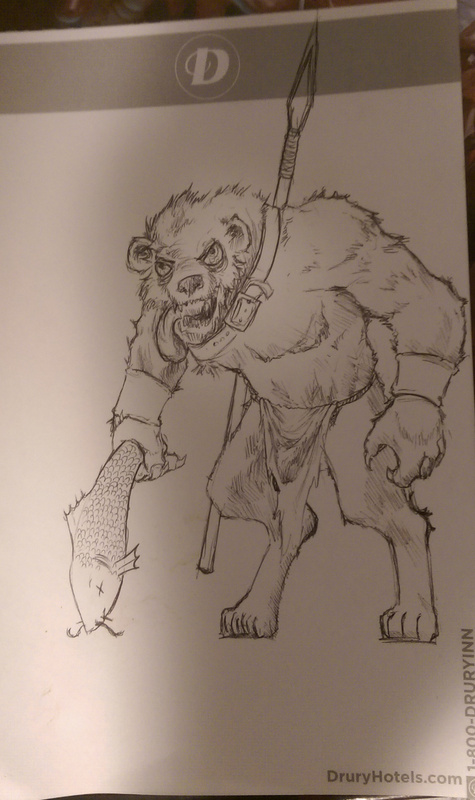 The random gnoll sketch Dan was given by a vendor last year. * (23:46) Ending a convention with heat exhaustion. Will there be a Fear the Con 2019?